A couple of days ago I deposited a fine basket of freshly-harvested tomatoes on the kitchen table. “I think I’ll photograph those,” I thought, and wandered off to get my camera in a languid Sunday-morning kind of way. When I returned half an hour later the tomatoes were gone, and my husband — all business and efficiency — was sealing the lid on a mammoth container of gazpacho, and popping it into the fridge. 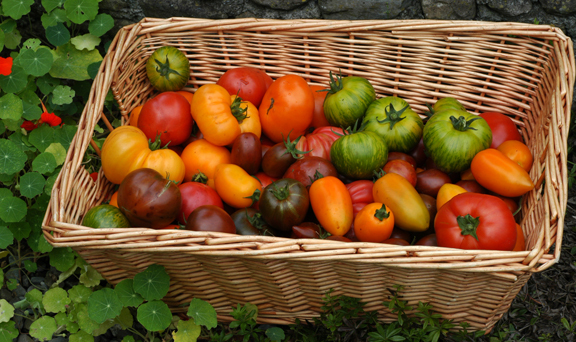 This tomato-filled basket is not the one in question, but is from the abundantly-tomatoed Glebe Gardens in West Cork. 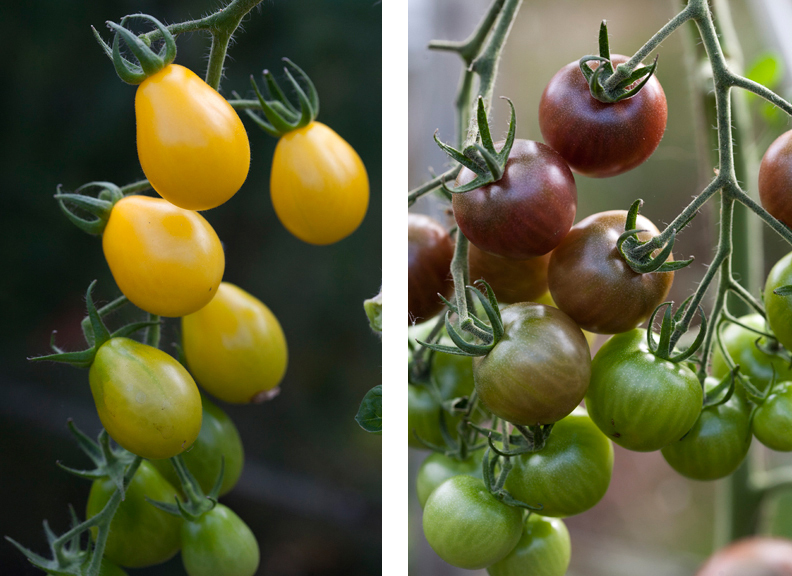 So, I was going to write about tomato-growing here, and this year’s favourite varieties (‘Dzintare Lasite’ and ‘Black Cherry’). But now I think we need to talk about gazpacho. Cold tomato soup. The idea is deeply unappetising, especially if you’ve been brought up on warm tomato soup — as many of us have. But, gazpacho, let me tell you, is a delightful thing. It tastes zingy and refreshing, with all the flavours and aromas of summer, but it fills you up in the most comforting way, like a winter stew. Although it is classic Spanish fare, its origins are Arabic, and its name means “soaked bread” (bread is the ingredient that makes it so filling). It is an ancient dish, and has traditionally filled the bellies of people across the Mediterranean. Hadrian’s Roman army had gazpacho among their rations. There is talk of an Indian summer in the UK and Ireland, and gazpacho is exactly the kind of food for those last-blast sunny days. Mix the tomatoes, cucumber, garlic, sweet pepper and bread with half the water in a food processor or liquidiser, and liquidise in batches. With the machine still running, slowly add the olive oil and vinegar. Taste and adjust the seasoning, and empty the soup into a large bowl. Slowly add the remaining water, stirring until it has all been incorporated. Cover and chill for 1–2 hours. I like that post. As I’m not a fan of even warm tomato soup, I don’t think I’ll chance the Gazpacho though! Darina Allen did a lovely tomato salad at the GIY Conference Demo – just chopped tomatoes (lots of different varieties) on a beautiful platter drizzled with honey, extra virgin olive oil and lemon juice and , sprinkled with maldon sea salt and black pepper. Finish with torn basil leaves. 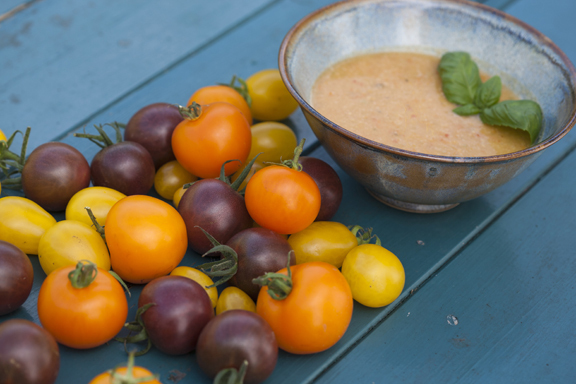 I haven’t actually tried it because I don’t grow tomatoes yet – it is a dream for next year! I have always felt that Gazpacho was just one step short of perfection and that perfection could be achieved by the omission of the cucumber, a taste I have always detested. To add insult to injury, cucumber always repeats on me so I avoid it at all times. I can still recall a corned beef and cucumber sandwich in Petticoat Lane in 1965 which spoiled a great day out. Re tomato soup, the hot soup, I have detested it all my life until the last few years when we started making a roasted tomato soup and I now adore it. The recipe came from a magazine article by Rachel Allen. I would like to hear more about your tomato growing, Jane. Did the two above produce well? Taste good? Among our tomatoes this year we grew two “heritage” tomatoes, “Black Russian” and “Brandy Wine”. Both of these produces huge tomatoes, big fleshy fruits, which were excellent for soups but a little too big for use in salads. Back to more normally sized tomatoes next year. Overall, not a great year for tomatoes here. Oh dear, Paddy. That sounds as if you may be suffering from PTSD relating to that 1965 cucumber! I’m not sure if I’ve had roasted tomato soup, but that may be next on the menu. We have rather a lot of tomatoes just now — but not enough to make into chutney. ‘Black Cherry’ is a good producer, as is ‘Dzintare Lasite’. Both have pretty good flavour. The other two that I’ve grown this year, ‘Polen’ and ‘Tangella’, are less so. The tiny yellow fruits of ‘Polen’ are clustered very tightly in the truss, so don’t get enough air or light in this climate. I love the big toms such as ‘Black Russian’ and ‘Brandywine’ in salads but I don’t think we get enough sun (even on a good year) to ripen them properly. ‘Dzintare Lasite’ is a Latvian variety from Irish Seed Savers, not a F1 hybrid. It grows really tall, and crawls up across the roof of the greenhouse. The skins are quite thin, so you have to be sure to water regularly to avoid splitting.I’m not sure if ‘Black Cherry’ is an F1 or not. 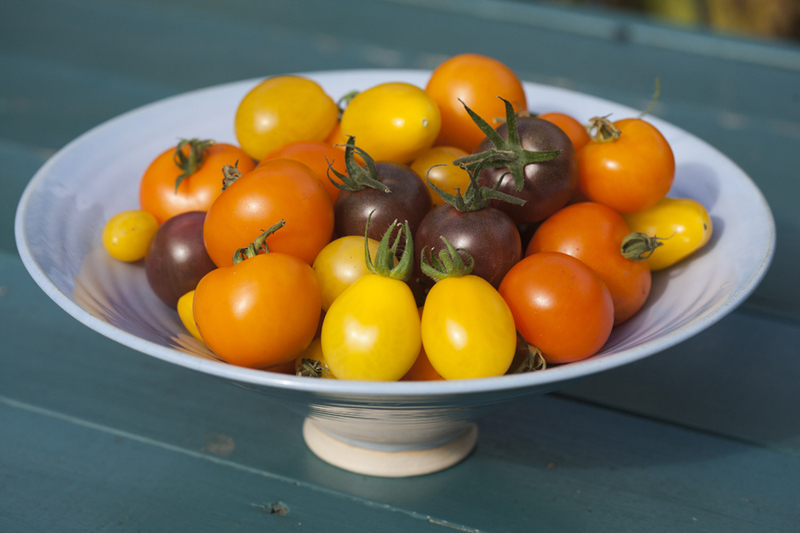 Hi Jane, thanks for that post, I picked a load of our sun gold tomatoes today and was just sitting looking at them in the basket wondering what I’ll do..so good timing. Bit timid about the gazpacho though,still growling about the lack of heatwave to warrant eating ‘refreshing’ foods. I was going to dry some in the slow oven of our range and see what happens..will definitely make some sauted small courgettes with tomatoes rolling around in the pan,garlic, lots of basil and a smidgen of lemon juice at the end. The writer feels it is necessary. However, if there are wheat issues in your household, you could try it without (and report back?). I wonder would a *tiny* bit of cooked puréed potato add some of the body that the breadless soup lacks? But you would want only the tiniest bit, just to add a hint of graininess. I think my ratio of cucumber (we have a glut to use up) to tomato was a little skewed & maybe I didn’t use enough breadcrumbs. The addition of vinegar is also something new to me. For peppers I used “padron”, (once again because we have a glut) they certainly pepped it up a ittle. I will need to try again. So I wonder what the gazpacho sans tomato was like prior to the love apple’s arrival post 1492? I read somewhere that is was just bread, water and olive oil. Also, there is ajo blanco, which I hadn’t heard of until yesterday (even though it is on the page after the tomato gazpacho in Rena Salaman’s Mediterranean Vegetable Cookery — the book I mentioned in the post). It’s made with blanched almonds. You are currently reading He pulped my photography project at One Bean Row.